I etched my first circuit boards today. I have found that I need better tactics for this to really work. The MDF base that I am using is not working, so I am going to try a poly cutting board, which should have better humidity tolerance. I also believe that taping the circuit board material down will improve the height differences. 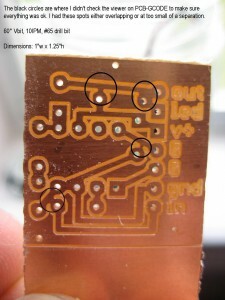 Using screws on the MDF made the middle of the circuit board material bind causing the router bit to etch more than normal, yet on the edges nothing would be removed. The picture above was the last circuit board routed. I made several mistakes even after ten boards. This last one I made the pads larger to make soldering easier. I didn’t check that I had a minimum spacing between isolations, and three of them didn’t get isolated. I just used a kitchen knife to scrape the copper. Once I figure out how to edit video in Ubuntu, I’ll have a step-by-step video of how to use PCB-GCODE with Eagle. Hey, I dig the site. One suggestion. I use double sided duct tape to fasten my copper clad to my milling table which is actually a base of MDF on top of some wood. It works wonderfully! Give it a shot if you haven’t. Thanks for the suggestion. I thought about this. I may have to try it and just be careful about my drill depths. Sure would hate to break a bit.